Description DermoscopyThe examination of [skin lesions] with a 'dermatoscope'. This traditionally consists of a magnifier (typically x10), a non-polarised light source, a transparent plate and a liquid medium between the instrument and the skin, and allows inspection of skin lesions unobstructed by skin surface reflections. Modern dermatoscopes dispense with the use of liquid medium and instead use polarised light to cancel out skin surface reflections. of parasitosisThis glossary term has not yet been described. Parasitosis, Scabies, Tungiasis, Larva migrans, Pediculosis, Tick bites Parasitosis – cite! Parasitosis (message) Parasitosis – participate! 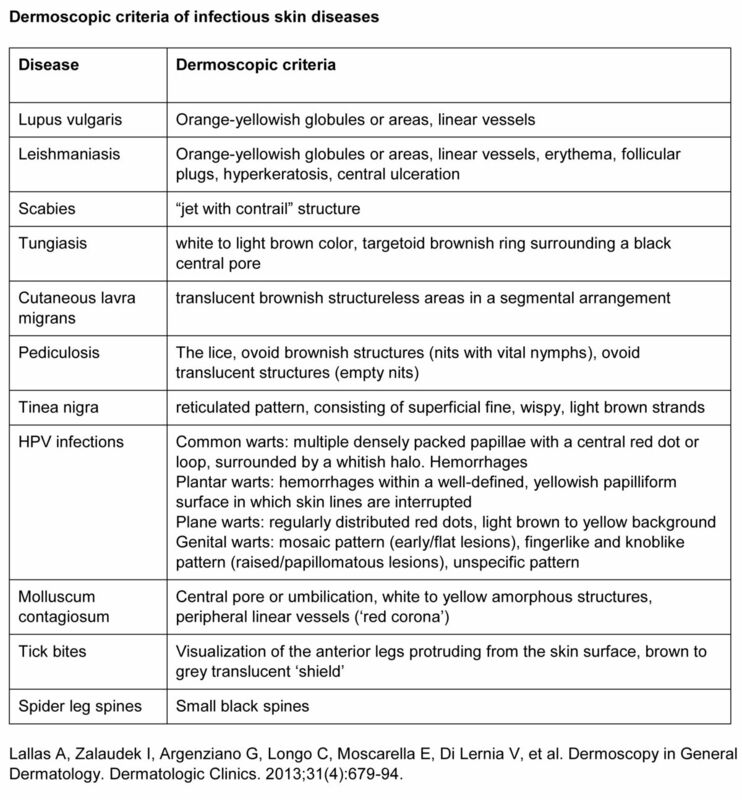 Specific dermoscopic patternsThis glossary term has not yet been described. have been described for several infectiousThis glossary term has not yet been described. skin diseases, including those of viral, fungal and parasitic origin. ↑ Zalaudek et al. : Entodermoscopy: a new tool for diagnosing skin infections and infestations. Dermatology (Basel) 2008;216:14-23. PMID: 18032894. DOI. This page was last modified on 27 October 2018, at 12:16.